Summer times means fresh fruit, grilling and ice cream! I've been on a huge ice cream making kick lately! My goal is to recreate Claudia's Ice Cream - the best tasting ice cream I've ever experienced. I served this in my restaurant; it was a bit more expensive, but worth it, for the real cream that she used and she didn't over whip air into it. Since Claudia's Ice Cream isn't available in Chicago, it's up to me to recreate it. I'm close. But what I'm also finding is that different flavors require different bases. Sure I could just make the same base and add varying flavors to it - but some flavors just require a lighter or a heavier base. Having some leftover dried Lavender that Aaron and Alina sent for the 'strange ingredients' challenge, I decide to match that with pure farmers market honey. These particular flavors lent themselves to something a little lighter, so the base needed less cream and eggs. I was a little worried about the amount of lavender I put in, thinking it was too much and too perfume-y, but after freezing it, I found I really liked it. And Dave loved it - he couldn't stop eating it, which I didn't expect at all. But if your nervous about a real heavy lavender flavor, just cut back, adding half the amount. You can always make a second batch and refine for your tastes. This would pair so nicely with a simple grilled pound cake, or a real dense chocolate cake. It's great on it's own as well. You'll be surprised with this recipe - in a good way. Mix, freeze and be fat and happy!! Add the cream, milk, lavender and honey in a pot. Bring just to below a boil, turn off heat, place a cover on and let steep for about 15 minutes. Then whisk together the yolks and sugar until the yolks turn a fluffy pale yellow (this is going take about 5 or 6 minutes, just keep whisking! You're building muscle!) Now, temper the eggs by add a cup of the warm cream to the eggs, one cup at a time. This is bringing the eggs up the the temperature of the cream slowly to avoid scrambling the eggs. Once you've tempered the eggs, add them to the pot and turn the heat on to medium low. Stir until the the liquid starts to thicken and coats the back of a wooden spoon (if you run your finger across the back of a spoon you can see a line drawn through the custard.) Do not boil though. Whisk in 1/2 teaspoon of vanilla. Strain into a bowl to remove the lavender. Place the bowl in a larger bowl of ice and water to cool. If you need to make the ice cream immediately, add it to your ice cream machine and follow the manufacturers instructions. If you can wait a day, place the custard mixture in the refrigerator for the night, and then continue with the ice cream machine after that. This helps the ice cream to become slightly smoother and creamier! 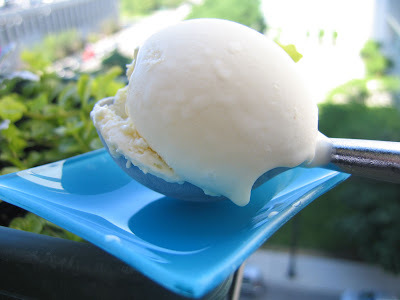 Check out my other postings for ice cream: Guinness Ice Cream, Mascarpone Custard, Blueberry Swirl and Black Pepper Ice Cream or see all my creamy fantastic ice creams.